PolyMarket Press began in 2005 as an alternative to releasing books through large houses such as F&W Publications and Krause. With them I released Create A Polymer Clay Impression and Celebrations With Polymer Clay, and I learned tremendous amounts. I was thrilled when I signed my first contracts with them and am very thankful for the opportunities to publish my first books. I grew as an author and learned a lot also in assisting my photographer Bob Grieser. I knew that I could not afford to keep him around every day and there are a lot of pictures to take along the way in a how-to book. Learning more about photography started to look even more alluring…as did being able to publish more books! The folks at the big companies are great and sure know their business. They do a lot, and they get to make all the choices about layout, do all the work of setting it up, and keep most of the money. They also can only do so many books a year, and most can only target large markets so as to maximize profit. They get to decide how long a book stays in print as well. The alternative is to get to make all the choices, do all the work, and keep whatever is left over after printing costs. So that’s what we do! There has been a tremendous learning curve over the last five years involving classes in digital photograph, Adobe programs like Photoshop, Illustrator, and InDesign, and programs like Open Office and WordPress. But when it all comes together, it is a creative connection of abilities that allows us to present beautiful work. 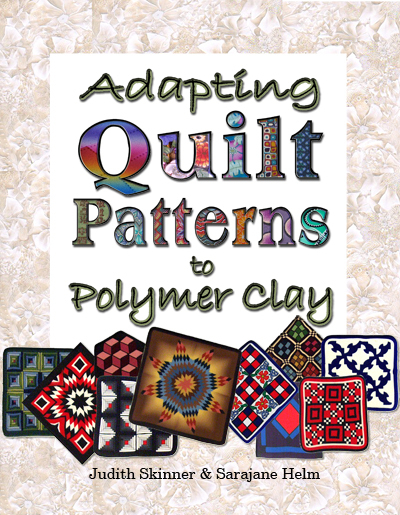 Our premier title Adapting Quilt Patterns To Polymer Clay was released in 2006, written by Judith Skinner and me. She created all the graphs and charts, I took the photographs, and we worked together to lay it all out. It features our polymer clay art along with 90 other artists working in the medium. 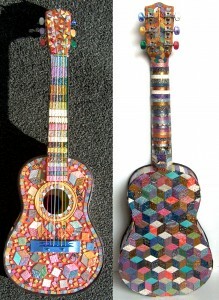 It combines a love of color, pattern and layout in the clay work and the book work too. It was a thrill to hold the first copy when it came from the presses, and I still like looking at it today! Judith Skinner and I are both working on upcoming books, but more about that in future posts. So glad you shared this picture…again.